Am I crazy or am I starting to turn to the dark side? Dark side being spice, woods and musks because I’ve had an unfortunate string of rather uninspired fruity floral fragrances. Perhaps my nose has finally moved on from trying to decipher how a raspberry smells as opposed to a blackberry. 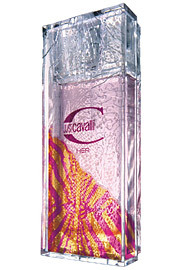 Just Cavalli Her seems like your typical fruity fragrance until it starts to dry, then you’re in for it. In Bottle: Fresh, crispy fruits settled in a clean citrus topper. The sweet jasmine in this is present in a big way as it tries to push and shove its way into center stage. Applied: Very odd, kind of unpleasant syrupy sweet floral notes on application. Like bruised flowers and some fruits drizzled with vanilla and rolled in sugar. Blackcurrant has this strange medicinal sweetness to it that I can’t say is helping the opener much in Just Cavalli Her. But wait out the opening and you’ll be rewarded with the emergence of this beautiful, very agreeable and mildly spicy cinnamon that horns in on the crazy syrup floral fruits and their little convention. The cinnamon gives Just Cavalli Her a nicer edge and a bit more complexity and helps take it back from the brink of syrupy sweet. This is a fragrance that teeters on the edge of cloying for me as I feel that cinnamon note might drop off but it is a good contender and stays until the final dry down of light woods and mild vanilla with the residual syrup. Extra: Just Cavalli Her is discontinued? There seem to be conflicting reports of this or perhaps Just Cavalli Her was recently discontinued. Maybe I’m thinking of a different Just Cavalli fragrance because I still see this stuff being sold. Design: Just Cavalli Her is bottled in a big rectangle. I’ve never held the item myself so all I can comment on is the textured glass is a nice touch that adds a bit of dimension to the whole design. Without it, the bottle really would be too plain. Notes: Bergamot, apple, bamboo leaves, blackcurrant, cinnamon, waterlily, lily-of-the-valley, jasmine, apricot blossom, coffee bean, amber, vanilla, white cedarwood, musk, tobacco. I found this one just too sweet with not enough creaminess to cut the syrup in this and actually found it reminded me of a perfume I smelled in my childhood. I believe it was someone in the family who wore it because I remember smelling it often. Reviewed in This Post: Just Cavalli Her, 2008, Sampler Vial. Disclaimer: The fragrance sampler vial reviewed in this post was provided to me for free. I am not in any way receiving pay or compensation for this review. This review was written based upon my personal experience and opinions of the product. This entry was posted in cavalli, floral, fruity, Reviews By House, spicy and tagged blog, cavalli, cinnamon, floral, fragrance, fruity, her, just, perfume, review, scent, spicy, syrup. Bookmark the permalink.